Tlfno/Fax: Spain - 918036953 Madrid, November 20, 2012. Subject: Breed Specific Legislation (BSL) “Dangerous” breed dogs in Waterbury City, USA. For the attention to: The Right Honorable Mayor O’Neil, and his Government Team. Dear sir, my name is Mariano Peinado and for me is a great honor to contact with you if you allow it to me. I am writing to you from Madrid, so please forgive any unintentional errors for my bad English. I love your country so much, beautiful Country and beautiful people, I am very proud of my so much USA friends, great people. I have the honour to be the president of the INTERNATIONAL ASSOCIATION FOR DEFENCE CANINE AND HIS RESPONSIBLE OWNERS (IADCRO) & FIAPBT. For me is a great honour to write to you in the name of all IADCRO & FIAPBT members and the animal rights lovers distributed around the world which endorse our work. I send you this information for your amiable consideration about the non convenience BSL in Waterbury City and in the States in general. 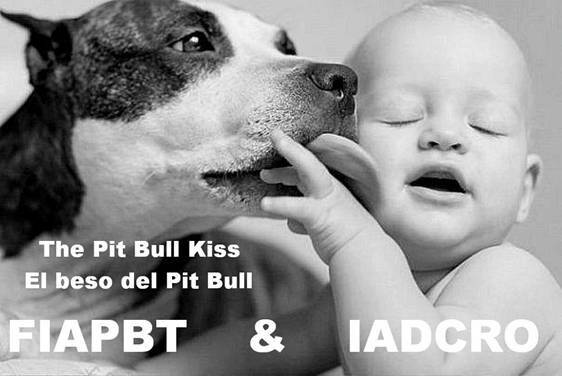 Located in Madrid the IADCRO & FIAPBT currently is composed by 39 Countries Members. Our goal is mutual despite the global barriers; to end any type of mistreat animal and to rid the public of dangerous irresponsible dog owners, independent of its breed. In IADCRO & FIAPBT we are people with more of 40 years inside of dogs. IADCRO & FIAPBT is composing by professional technicians around the dog like for example; ethology scientists people, naturalistic, veterinary, university professors specialized in genetics, breeders, trainers, biologists, etc. The reason to communicate with you, is for to give you and your executive team some suggestions if you allow us of course, we would tell you that in our humble opinion about the breeds dogs criminalized in the States, specially the American Pit Bull Terrier (APBT or PIT BULL), Rottweiler, GSD´s, American Staffordshire Terrier, Staffordshire Bull Terrier, Japanese Tosa, Dogo Argentino, the Fila Braziliero, American Bulldog, etc. showing to us their malaise and preoccupation by their doggies which are considered member of their own families. The information that I come to provide to you, comes from several professional sectors of the canine union of several countries, that show their opinion under the experience acquired in the course of theirs lives, about the existence or not existence of “Dangerous or Potentially Dangerous” breed dogs. The professionals more remarkable than guarantee this information, are those that are more than enabled to advise to the executive, with respect to the existence or not of Dangerous or Potentially Dangerous breed dogs and it has not considered to them to advise, I talk about the information that the ethology scientists people provide to us. The ethology scientists people, are the scientific professionals more indicated and better qualified to talk and to advise about the American Pit Bull Terrier and the others breed dogs, since they have studied during many years the character and behavior of the APBT and its surroundings. Ethology is the science that studies the behavior of the free animal and, when it does with domestic animals (as it is the case of the dog) realises it since the approach of applied Ethology. Several ethology scientists people of different countries, have declared publicly from point of view scientific, that none breed dog are not a dangerous, nor the American Pit Bull Terrier for being the worse breed dog considered between the rest of breed dogs, is not either a dangerous breed dog, is a breed dog like any other within species canine and that everything will depend by all means for the dog will be dangerous or no, on the surroundings in which it grows up, and on the education that received by its owner, unique person in charge of the damages who could make his animal, like the father is it with his minor son. Also the ethology scientists people emphasize, the nonconvenience of classifying or of cataloguing breed dogs in negative way, so that it goes to the detriment of this marvellous and noble breed dogs and it confused to the citizens, to the point to even cause an unwarranted social alarm, quite harmful in several aspects for the own society. I have provided our research data on the bite stats for several Cities and countries further in this correspondence, because is good idea for to open eyes to incredulous and sceptical people, so we think that would be a good idea that would not be to discriminate and to catalogue breed dogs like Dangerous or Potentially Dangerous, only would should be to describe in the BSL to the Potentially Dangerous dog like individual and by his activities of behavior, independently the size without giving importance if the dog is of one or the other breed dog or mixed dog. Also we think that would be a good idea to describe in the BSL to the owner irresponsible of dog, for this way fomenting and teaching to be good responsible owners of dog and to describe in the BSL too, the activities realised with dogs contemplated like crime, like for example it could be the organized fights with dogs or other activities in which mistreats or the life of the dog is put in risk. Our thinking is that all breeds can be dangerous or none, that the only means to identify what is or is not a dangerous dog like individual is by his behaviour and not by his breed. Some countries that had adopted negative Laws against American Pit Bull Terrier and others breed dogs, but since many years ago and not of now, concretely since the year 1991 as it is the case of England, in 1993 the case of Holland, Italy, Bermuda, Germany, etc. After to have studied the Governments of this Countries the information that from IADCRO & FIAPBT we made them arrive at the same time and, to the salary verified by their own eyes the inefficiency of this type of Laws that criminalizes and excludes American Pit Bull Terrier and others breed dogs of their corresponding countries, included/understood the total inefficiency of the Law when not offering security to their citizens, since the statistics of attacks of dogs to people of his country indicated that not only it had not been reduced the attacks, quite the opposite, had been increased the attacks and the deaths although to have excluded American Pit Bull Terrier and the others breed dogs of all their national territory, since the attacks were produced by dogs of any breed dogs and its mixed. The governors of these countries, understood the necessity of the creation of a Law that did not name “Dangerous or Potentially Dangerous” breed and the correct way is foment and teach to be a RESPONSIBLE dog owner, without mattering if them were American Pit Bull Terrier owners or a Cocker owners, because a Cocker into the hands of an IRRESPONSIBLE owner, also can bring about deaths of people, not only by accidents of traffic when trying to run over to the animal, also by the mortal bit that can cause these dogs of small size to young children, which although are young are people also as all we know. I give to your executive team all the papers regarding Pit Bull Law Holland. The Report of the Committee of Wise led to the amendment of the law. This report was an investigation into the actual number of breeds of dog bite incidents. It was clear that the American Pit bull Terrier is not in the top 3. In that video you can find the movies from the first American Pit Bull Terrier shows in the Holland after the end of the American Pit Bull Terrier law. Also you can find to movies from the demonstration against the law en the fight for getting the dogs back by there owners, and the terrible things that they did with our dogs. “To rectify it is of wise people” and this attitude, the citizens values it and are thankful so much for it. England pioneering country in this type of Laws against some breed dogs, has been seen the great error that has realized in the year 1991 when have banned the APBT and other four breed dogs. At the moment of the present time, England very soon will go to rectify that ineffective Law of 1991 called DDA, after 21 years of experience with an ineffective Law that has remarkably harmed the security of its citizens. In Spain and Colombia, has also rectified its Laws after to take our recommendations, when the Government of this Countries has been decided to ban in the first moment the American Pit Bull Terrier. Like Holland, Italy, Bermudas and the Germany Governments, they have through years of failure to reduce dog related injuries, finally come to the understanding that banning by breed will not provide a safer public. This is an ownership issue not a breed issue. The breed dogs does not make bad dogs, is the people (Irresponsible and bad owners) that make it that way. Then the problem, We think would be due to take a cut from the root, condemning to the irresponsible owners of dog, instead of condemning some breed dogs. 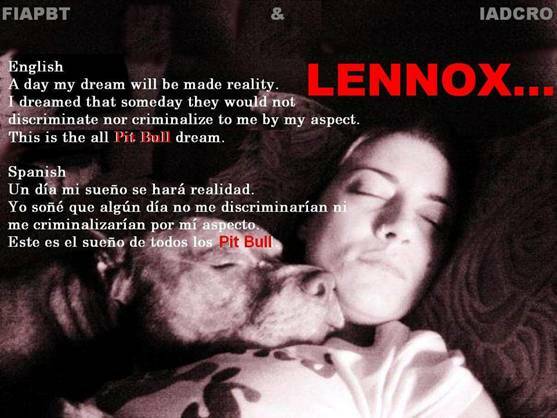 The people that criminalized or banned the American Pit Bull Terrier, Rottweiler, GSD´s, American Staffordshire Terrier, Japanese Tosa, Dogo Argentino and the Fila Braziliero, etc. in any place, when happened a time under this prohibit Law and by their own experience verify that the attacks of dogs to people instead to be reduced the real thing is that the attacks of dogs to people were increased, by the ineffective of the BSL, then What do they will do? Be eliminating more breed dogs one in one until reaching more that the 400 existing breed dogs and that are equipped with a physically strength even to kill an adult and strong man? And with the crossings of all these 400 breed dogs, What do they will do? so that the crossings of these more 400 breed dogs also are more than enabled even to physically to kill an adult and strong man. We know that it is a difficult question. The honourable people that are criminalized or banned these noble breed dogs in the States, would have to know that strength or size of a dog is not synonymous of aggressiveness. We would not have to play to being God, for to decide what breed dogs must live and which to disappear or to die. This would not have to be thus, of course that not. We put to the American Pit Bull Terrier of example, for be the worse considered and mistreated breed of all the five criminalized breeds, so that you understand the error to consider badly any breed dogs. Criminalizing breeds is the ruin and the extinction of the breed and like rational people that we are the humans, we would have to make the opposite. To remember that the dogs have been always from the beginnings of the humanity, the best friend of the man, facilitating to us company, security and food for can to eat day to day for our survival. We can observe, that in some countries where some breed dogs were catalogued like “Potentially Dangerous”, the attacks of dogs to people with the spend of the years after to be implanted the Breed Specific Legislation (BSL) “Dangerous” breed dogs” the attacks of dogs to people not only did not fall, unfortunately were increased and by breed dogs that are not considered "Dangerous", as always it had been ocurred. Of it has comes the disappointment from many ex-owners of dogs in owning dogs, when they at the time acquired dogs of breeds catalogued like very good and helpful, used even like dogs for blind people, like they are the Labrador Retriever, Golden Retriever, Collie, etc. and could verify in his own meats, that these dogs educated incorrectly were very dangerous with the adult and young people. 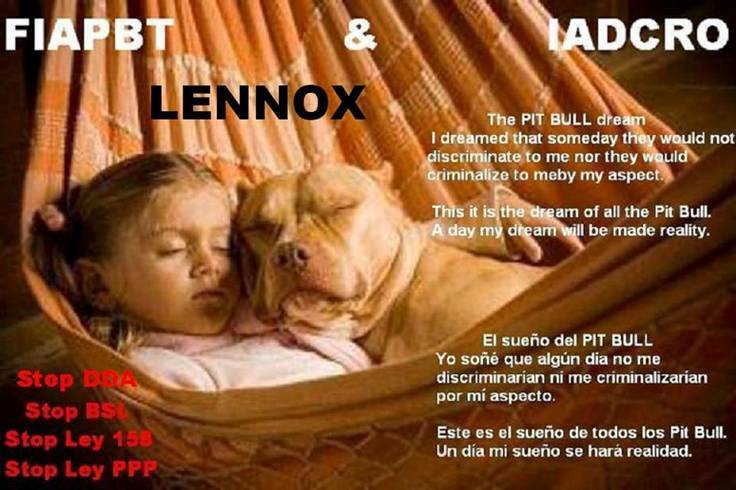 For this reason from IADCRO & FIAPBT we suggest to you, that the BSL would not must to discriminating and criminalizing breeds dogs and yes, would be needed to foment and teaching to be a responsible owner of dog, indifferently the breed that the dog owners have. Acting in this sens Right Honorable Mayor O´Neil, in our opinion the BSL will be able to offer a greater protection and security to the citizens and at the same time, also a greater protection to the dogs would be provided. 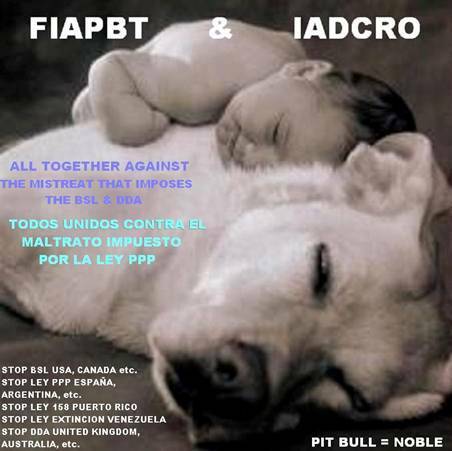 All IADCRO & FIAPBT members and the animal rights lovers distributed around the world and endorse our work, we would be very much thankful to you Mayor, if you and your Government Team would can considered our information of this letter, for that the American Pit Bull Terrier and others criminalized breed dogs, stops being criminalized or banned in Waterbury City, but yes, describing in your Dogs Law or BSL to the Dangerous dogs but always like individual one and by his activities of behavior and not by its breed, giving importance to teach and fomenting to the RESPONSIBLE owner in the BSL and not give importance to the size, the breed or the mestization and since that moment, the Dog Law or BSL would begin to be effective and giving real security for the citizens. The Law instead of to be called Breed Specific Legislation (BSL), would pass to denominate Dog Specific Legislation (DSL). In IADCRO & FIAPBT we are to your whole disposition for help if you will need it. In the following 3 links, show it like is REALLY the unknown breed dog American Pit Bull Terrier. The problem is not the breeds, the problem are the irresponsible owners. Then the Laws like BSL, DDA, Law PPP, etc. must to foment the responsibility in the owners and not to criminalize the breed dogs. The correct thing is to Juzge each one and for individual case and not in general like the BSL are doing right now. We belive that our eyes have been seeing since many many years ago and we do noy belive that the paparachis bad inform to us since its comunications media. We think that is not good for us to believe all those that the mass media tell us. If you wish to learn about this wonderful and noble breed dog, here you have your opportunity and after it we believe that you will can talk with the TRUTH and in the RIGHT way. The TRUTH will be very good for our Mind, HEART and our SOUL. Work that through the excellent critic generated in diverse society sectors, happens to be a wonderful contribution for the humanity interest, since previously to this work nothing similar in no place had never been realised. TO RECTIFY BADLY REALISED AND UNJUST LAWS, IS OF SINCERE, HONEST, DECENT AND WISE PEOPLE. Know the TRUTH = FREEDOM ... Feeling FREEDOM = HAPPINESS! ... Every day is an opportunity to be freer and happier than the before day. Each new day is a gift from the UNIVERSE ENERGY ... a Present! SAY YES TO LIFE PLEASE, DOING IT FOR YOU, DOING IT FOR ALL.